A bit about shrinkage…and stitching a binding! I let my border dry overnight and this is what I woke up to! Oh well. That is why I keep a lint brush handy! So once I removed the dog hair, I placed the border (wrong side up) on my ironing board (which has a really thick towel on it) so I could press the border nice and flat. I used a dry iron and just a bit of Best Press. I press the blocks and border on the wrong side so that I am actually pressing the background fabric, and not just the applique pieces. Next, it was time to trim the border down to the correct size. I always cut my blocks 2″ larger than the finished size to allow for shrinkage during the applique process. I actually cut these borders 2″ wider and 6″ longer than the finished size. You may wonder exactly how much does a block (or border) shrink? Well, my border shrunk about 2″ in length….yikes! Which is why I am so happy that this pattern was designed with shrinkage in mind! More about that in my next post. First I made sure I could see the line that will eventually be the scallop because that is the line that the bias will be stitched along. Next, I started stitching the bias along the marked line. It is important not to stretch the bias binding….trust me, it wants to stretch! In fact, you need to ease a little more binding into the quilt. I like to use my stitch ripper to ease the fabric in place. Don’t try to ease too much fabric in…. …..you will get a pucker! Keep that stitch ripper handy! So, when it came to the spot where the scallops come together in a point, I just inserted a pin to let me know where the exact point is. Those inside points should look something like this. This technique works so much better if you lock the cat in the bedroom! Where did I put that lint brush? Once the bias was stitched in place, it was time to trim off the excess fabric. But first, I checked the back to make sure there were no pleats or puckers. Now it was time to trim the excess fabric! These are not magic scissors that cut all by themselves!! It’s just that I can’t operate the scissors and the camera at the same time!! I recently purchased some Wonder Clips designed specifically for binding a quilt. I love them…love them! And, this is what that little pleat looks like. Sweet! Yesterday was our last meeting of The Sunday Afternoon Applique Group until September. We presented Kathy F. (on the left in the photo) with a quilt we made for her daughter, Karen, who is undergoing cancer treatments. Each one of our members made a block. We did not decide on any colour scheme, except the background. It is lovely how it all came together! Thanks to Colleen at Elite Quilting for doing such a lovely (and speedy!) job! 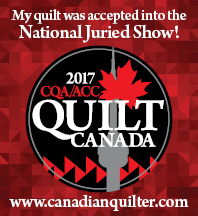 And last, but certainly not least, if you attended Quilt Canada this month, you will recognize Brenda’s quilt. (Brenda is on the left in the photo). Brenda is an amazing applique artist (as well as an awesome quilter in general!). This is Brenda’s version of Aunt Millie’s Garden, although the inner border is her own original design! Congratulation, Brenda! Finishing a border and starting a binding! I spent yesterday putting the finishing touches on the second border of Sue Garman’s “Friends of Baltimore”. All of the flowers and stems and leaves were finally stitched in place. So, it was time to add the little red berries…..
…and the embroidered stems. I like to use 2 strands of embroidery thread for the stems. Each of the 13 roses has a (really tiny!) yellow center, so I prepped those, also. Once the yellow centers were stitched in place, I did some more embroidery. Each of the roses and a few of the buds have these tiny little “hairs” stitched around them. They are stitched with just one strand of embroidery floss. And now for the fun part! When I am finished stitching a block or border, I wash it to remove the glue and starch and the marks from my water-soluble marker. It is a simple process, really! I fill the sink with hot water and add a bit of dish soap or Soak (if I happen to have some on hand). Next, I just toss the block in and let it soak for about half an hour. Then, I drain the water and rinse with tap water. I leave it fairly wet and lay it out on a couple of thick towels to dry. Easy peasy! Next on my “To Do” list was “Put Binding on Circle of Tulips”. To figure out how much binding I would need, I measured around each scallop and multiplied by the number of scallops. According to my calculations, I need approximately 308″ of binding. I cut the bias strips 2 1/2″ wide and joined them all together in one long strip. Next, I pressed the strip in half lengthwise, wrong sides together. And, I started stitching. So far, so good! First, I woke up yesterday with one thing on my mind. Finishing the hand-quilting on Circle of Tulips! I am sooooo close! I must admit, though, I have been in my pre-mourning stage for a week or two. I start to miss the quilt before it’s even finished and I wonder what I will do to fill the void. Sad, but true!! So, after a couple of hours of stitching and watching re-runs of Downton Abbey, I am finished! Yippee!! Now, I just have to bind it! The pattern for this block is available as a free download on my website. I have also been making some progress on the second border of Sue Garman’s “Friends of Baltimore”. This is the left side of the vase almost finished. So, now it’s time to start the right side of the vase! I added the fern and a few roses and buds. I find a spot on the pattern where I can inconspicuously hide the joins. Now you see the joins…. To keep my (extremely unorganized) self from losing track of all those leaves and flowers, I prep them in my usual way and then I glue the pieces to the paper pattern. Also, when I cut the freezer paper shapes out, I place them on the paper pattern in the spot they will eventually be glued and stitched, just to keep everything nice and organized. So, now I just pick up each piece and place it on the background. Easy peasy! So…here is the right side of the border! And, finally, the border is (almost!) finished…I just have a bit of stitching to do! Recently, my hubby and I took a very last minute road trip to New York City, just for the fun of it. Of course, we did all must-do things when you visit NYC. See the Statue of Liberty…check. Figure out the subway system…check. Walk in Central Park..check. Visit The City Quilter…check! When we visited Central Park, I couldn’t help but notice the sidewalk stones. Hexagons…everywhere. I was inspired! So, when we visited The City Quilter, I picked up some paper foundations to make some hexies. Ok, maybe I went a little overboard! I couldn’t resist a few charm packs, just so I could get started! So this is how I spent the Easter weekend…making hexies! Very addictive! I am making them the old fashioned way…stitching the fabric to the paper template and whip stitching them together. Very relaxing! I am trying hard not to over think things and just keep them scrappy. In between my new found hexie obsession and cooking Easter dinner, I managed to finish the Xebec block of Sue Garman’s Ladies of the Sea. Once the ship was complete and the flowers were stitched on, I started the skull and crossbones bones. I must admit, I love this little touch! Next, I embroidered the ropes. When I was finally finished, it was time for a bath. I have just turned the third(!) corner of Circle of Tulips. Good times! It’s all about the details! That is what I learned in Sandra Leichner’s class when I attended TESAA last month. This is the block we worked on in class. Sandra’s quilts have an almost life-like quality to them, thanks to the incredible details, which include embroidery with just a single strand of thread around berries, fabric paint and choosing the perfect fabrics. You can see Sandra’s beautiful quilts here. I like to use Ultra-Suede for really small, intricate shapes, like calyxes. I purchased some packages of Ultra-Suede from Faye Labanaris, one of the wonderful merchants at TESAA. Check out her website here. If you have any question at all in regard to using Ultra-Suede, make sure you take the time to watch her video. It may just be the best 10 minutes of your day!! Of course, I would have liked one of everything she had for sale, however, I played it safe and chose a green package and a gold package. Each piece measures about 3″ x 6″. As you can see, you get a lovely assortment in each package. When using Ultra-Suede, simply cut out around the shape (no seam allowance is necessary). I stitch it in place using the same applique stitch I use for “normal applique”. Don’t tug your stitches too tight or you will end up with “dimples” around the edge. I started to think about what I learned in Sandra’s class and thought I might try embroidering around the calyx, just to give it a more “finished” look. So, I used just one strand of embroidery floss close to the same colour as the Ultra-Suede. This is a picture when the Ultra-Suede is just glued in place. This is it after it is stitched with thread. And, after the embroidery. See? It really is about the details!! As you can see, I have been plugging away at the border of Friends of Baltimore. I am working on one side of the border at a time, just to make the stitching a little more manageable. And, I am working away (slowly, but surely) on Rita’s block. I have an awesome plan for this block!